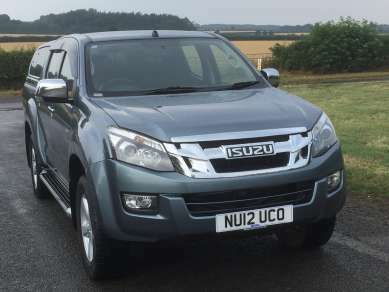 AUGUST 2012 ISUZU DMAX 2.5 TD YUKON 4X4 DOUBLECAB PICKUP, 6 SPEED MANUAL GEARBOX, MINERAL GREY, 68,450 MILES, REMOTE CENTRAL LOCKING, AIR CON, ELECTRIC WINDOWS, ELECTRIC MIRRORS, RADIO/CD, CLOTH SEATS with Tailored Seat covers, ALLOY WHEELS with 255/65R17 Tyres, RUNNING BOARDS, OVER RAIL LOADLINER, TOWBAR WITH SINGLE ELECTRICS, SPARE WHEEL, REAR PARKING SENSORS. AEROKLAS COLOUR CODED CANOPY. SERVICE HISTORY.